Dirk Verhoeff, interim director of the Dalton-Whitfield Solid Waste Authority, was recently named the sole finalist for the post of director. The authority's board is expected to finalize his appointment in November. Dirk Verhoeff says becoming director of the Dalton-Whitfield Solid Waste Authority has been "a professional and personal goal of mine" for several years. Verhoeff has worked for the authority for nine years as environmental manager and project manager and has been interim director since shortly after director Norman Barashick announced his retirement after more than 20 years with the authority in May. And earlier this month, the authority's board named Verhoeff the sole finalist to be the authority's next director. Authority employees are legally employees of the city of Dalton. Dalton Human Resources Director Greg Batts said Verhoeff's salary has not been finalized. He said ads for the job did not specify a salary but Barashick was earning about $90,000 a year. "It was an easy choice," said Whitfield County Board of Commissioners Chairman Mike Babb, who is on the authority board. "Dirk has regularly reported to us during our meetings, and he came highly recommended by Norman. We felt that we had a good employee who had been there for several years and had taken on increasing responsibility during that time, and we thought that we need to encourage and reward that sort of employee." Verhoeff has a bachelor of science degree in environmental engineering from the University of Tennessee at Chattanooga. "As environmental manager, I've been responsible for all the regulatory compliance and reporting that goes along with operating a solid waste facility," he said. "We have permits with the state and the feds. There's a lot of monitoring and reporting that goes along with that." "And on the project management side, when I started, they had just started the landfill natural gas collection system, so I have managed that from day one," he said. As director, he will be responsible for the budget and financial side as well. The authority has an annual budget of about $5 million. "We are an enterprise fund, so all of our revenues come from the customers who use our services," he said. The authority has 36 full-time employees and three part-time employees. It operates the landfill on the south end of the county and convenience centers on Martin Luther King Jr. Boulevard in Dalton, McGaughey Chapel Road in Cohutta and Miracle Drive in Westside. It also oversees and monitors the closed landfill in Westside. Verhoeff says he doesn't foresee any major changes at the authority. "We've got staff who have been here 20, 25 years. Everything runs very well, so I don't see any need for change, at least not right now," he said. "I'm rooted in the community. My wife is a Dalton native. We have two children, and I'm really excited about this opportunity," he said. On May 11, 2016, the Solid Waste Association of North America (SWANA) Georgia Chapter held its annual Equipment, Mechanic, and Truck Road-E-O at the Southern Pines Ag and Expo Center in Dublin, Georgia. This chapter event was held to qualify competitors for the SWANA International Road-E-O to be held at the same location on September 3rd. The equipment, mechanic, and truck Road-E-Os are just one way that SWANA tries to give back to and recognizes the outstanding personnel in the solid waste management industry. Four employees of the Dalton-Whitfield Solid Waste Authority participated and placed in the May event which qualified competitors from both the private and public sectors. Competitions were held for automated side- loader, front load, rear load, roll-off, and tractor trailer under the truck categories; dozer, articulated dump truck (ADT), rubber-tired loader, and track hoe in the equipment categories; and mechanics. Competitors skills were tested as they maneuvered through challenging courses. Dalton-Whitfield Solid Waste Authority employee, Marlon Cole, placed 1st in the Track Hoe event during the Road-E-O competition in Dublin, Georgia this May. His top scores in the Equipment competition category earned him the title of “Top Gun” and a spot at the International Road-E-O event next month. McKenny Pittman, who represented the Dalton-Whitfield Solid Waste Authority at the Road-E-O in May, placed 2nd in the Front Loader event which is part of the Truck competition. Pittman will move on to compete in the International Road-E-O event in September. Josh Kruse, a Dalton-Whitfield Solid Waste Authority employee, participated in the Equipment category of the Road-E-O in May which was held in Dublin, Georgia. Josh Kruse placed 3rd in the Off Road Truck event, and in the Rubber Tire Loader event. Joel Scott, SWANA Georgia Chapter Treasurer, recognizes Eddie Ashe at the Road-E-O competition in Dublin, Georgia this May. Ashe, an employee of the Dalton-Whitfield Solid Waste Authority, placed 3rd in the Dozer event which is part of the Equipment competition. The Dalton-Whitfield Solid Waste Authority is slated to be a monitoring site for the large-flowered skullcap, a rare plant that is found in the wild only in northwest Georgia and southeastern Tennessee. Representatives from the Georgia Department of Natural Resources (DNR) recently meet with representatives from the Authority to establish a monitoring site and ensure the continued success of the plant. Below is an excerpt from a recent article from the DNR. Photo courtesy of Plant Delights Nursery, Inc. Surveys by Thomas have also uncovered other large-flowered skullcap populations and promising conservation partnerships in the region. A hardwood drainage owned by the Dalton-Whitfield Solid Waste Authority and protected under a conservation easement features skullcap and lanceleaf trillium, a species DNR monitors. Such partnerships could help large-flowered skullcap win its battle to not only survive, but thrive. Sealed proposals will be received by the Dalton-Whitfield Solid Waste Authority for LANDSCAPING SERVICES (MOWING AND TRIMMING) AT THREE (3) CONVENIENCE CENTER LOCATIONS WITHIN WHITFIELD COUNTY, on Monday, July 14, 2014 until 2:00 P.M. EST. Sealed proposals shall be mailed to Dalton Whitfield Solid Waste Authority, 587 Gazaway Road, Dalton GA 30721 or hand delivered to the Dalton Whitfield Solid Waste Authority’s administrative office, 587 Gazaway Road, Dalton GA. Proposals will be publicly opened and read at that time. Click here to download the complete RFP (PDF document). 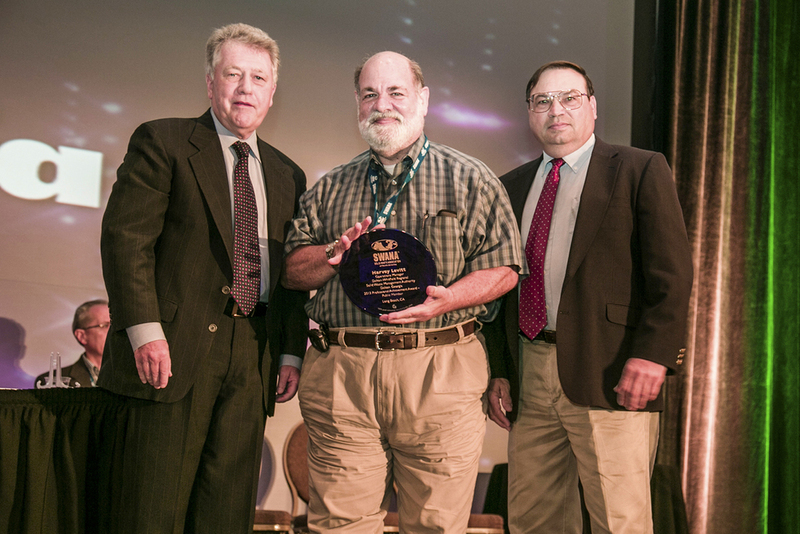 Harvey Levitt (center) receives the Professional Achievement Award for the Public Sector at a recent conference from representatives from the Solid Waste Association of North America. Harvey Levitt, former Operations Manager at the Dalton-Whitfield Solid Waste Authority (DWSWA), Dalton, GA, was recently awarded the “Professional Achievement Award-Public Sector” by the Solid Waste Association of North America (SWANA). Given annually, this award recognizes SWANA Members for valuable and distinguished contributions to the Association, the individual’s employing organization and the general public. The length of continuous contributions and services by the individual is a consideration in the selection. Harvey is a certified landfill operator in Georgia, and has participated for 20 years in the Georgia Landfill Operator Certification Training program as lead moderator and teacher. He served for 14 years as the Georgia Chapter’s treasurer, has participated in multiple committees, and continues to sit on the board of directors. For more information, contact SWANA at 1-800-467-9262 or SWANA-Georgia Chapter at 770-822-9309. Or visit www.swana.org or www.gaswana.org.